He was the baby-faced wrestler, who grabbed the eyeballs when he became the youngest Indian men wrestler to feature in the Olympics (2012 London Olympics) at the age of 18. The precocious talents of Amit Kumar came to the fore when he scooped up a sensational silver medal in the 55-kg category of the 2013 World Championship held in Budapest, losing to Iran’s Hassan Rahimi – an opponent he defeated in the first round of the London Olympics. Riding high on confidence after winning the gold medal at the recent International Wrestling Championship held in Sassari City, Italy, the 21-year-old grappler has set his sights on pocketing a yellow metal at the 2015 World Championship to be held in USA later this year. The Haryana wrestler, who is employed with ONGC as an Inspector, spoke about his preparations for the big-ticket event among others in an exclusive interview. Q. You must be on a ‘high’ after bagging the gold medal in the 57-kg category at the recent International Wrestling Championship held in Sassari City, Italy? I was really pleased to win the gold medal as the upcoming 2015 World Championship is going to be held in a few months’ time in USA. The competition in the Italy tourney was stiff and I’m glad that I was able to pocket the yellow metal, which will surely give me a lot of confidence ahead of the World Championship. Q. You initially started off in the 55-kg category and later switched to the 57-kg category at the 2014 Glasgow Commonwealth Games, where you attained your career-best gold medal. Winning a gold medal at the 2014 Glasgow Commonwealth Games gave me a lot of satisfaction as it was my best international performance for India, but I have to admit that the competition was not of high standards as we usually witness in World Championships or Olympics. On a personal level, I was chuffed with my gold medal effort since it was my CWG debut. Q. You made your senior international debut at a tournament in USA in 2011, but you must have been thrilled to bits winning the silver medal at the 2013 World Championship in Budapest? Yeah, I fought hard against Iran’s Hassan Rahimi in the final but lost to him. I had beaten him in the first round of the 2012 London Olympics and knew how to counter him, but a few lapses in concentration led to me settling for the silver. Q. How exciting was it for to know that you are the youngest Indian men wrestler to take part in the Olympics (2012 London Olympics)? 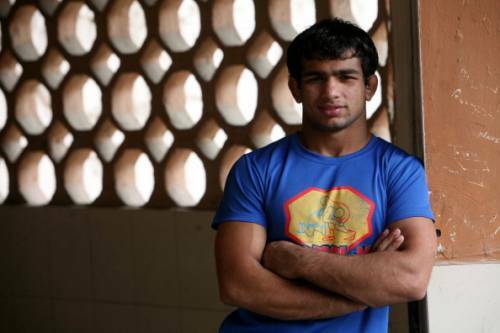 First of all, I did not know that I, at the age of 18, was the youngest Indian men wrestler to feature in the Olympics. It was only after I played my first round, my coaches told me that I have created a record and was happy about it. Q. The 2015 World Championship is being held in Las Vegas, USA in September this year. You must be bullish about your prospects? I will be looking to win gold in the 57-kg category. I know the competition will be tough as grapplers from Russia, Georgia, Japan, Korea and Iran are really good in my weight category. My confidence is high after winning in Italy and I’m sure I will go for gold in Las Vegas. I used to do wrestling when I was in class three or four at our government school in my village. One day I, a third or fourth standard student then, was asked to engage in a wrestling bout against a standard seven guy and I defeated him and my school seniors took me to the akhara of Hansraj ji, who later introduced me to legendary Satpal Singh’s akhara, where I have been training since 2005. Q. What’s your take on the popularity of wrestling in India? Look, before 2008 no parents would have wanted their children to take up wrestling, but after Sushil Kumar and later Yogeshwar Dutt won Olympic medals, parents are more serious about putting their children into wrestling. Our wrestlers are regularly winning medals in World Championships and Olympics and youngsters are more keen to take up wrestling. Q. There is a line of thinking that Amit Kumar is an Olympic gold medal prospect considering that you are just 21 with medals in World Championship and CWG under your belt. I’m delighted to know there are expectations from people to bag an Olympic gold medal. Having played in the 2012 Olympics was a big exposure for me and I’m sure in 2016 Rio Olympics that experience will come in handy. I will go all out for the yellow metal.